Since this is set in the Victorian era, you could say that Hands of the Ripper has a plot that’s gruel, rather than wafer-thin. Still, it’s satisfying for the most part. 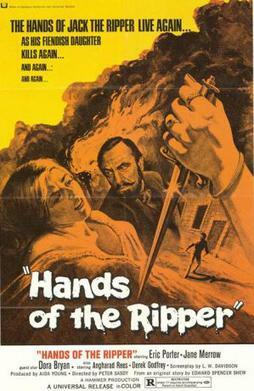 Yet another retelling of the Jack the Ripper legend, Hands of the Ripper (or as it shall henceforth be known, HOTR, not to be confused with LOTR aka Lord of the Rings) is a fun yak-fest with a couple of super-cool kills. The flick tells the tale of a young girl, Anna, employed by a grifter psychic*, who uses her for a “talk to the dead” ruse. A Freudian analyst, Dr. Pritchard, takes in one of these sessions, then out of pity, takes in the girl, housing, clothing her. Soon after she’s bathed and given new clothes, Anna is flashing back to a childhood trauma…the murder of her mother at the hands of her father, Jack the Ripper. 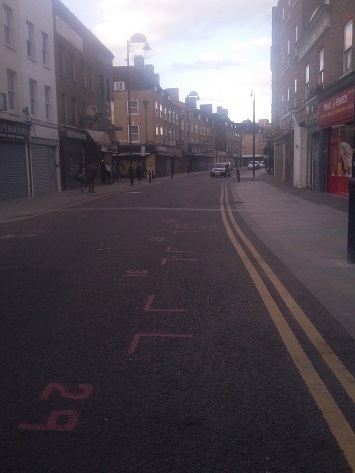 Jack the Ripper, the butcher who murdered (by most accounts) five prostitutes in London, terrorizing the populace and taunting the police before promptly disappearing, continues to fascinate. And no doubt more film adaptations are in the offing, and you can bet none as creative as this one. Neither as slick as From Hell, nor as richly historically detailed as Murder by Decree, HOTR is a nonetheless worthy Ripper entry, with Hammer’s stamp all over it. And you know what that means: incredibly ornate staircases, candelabra, flickering shadows…all the good stuff. And if we were still in the business of chronicling odd horror movie deaths, we’d have included the film’s hat pin and fireplace poker demises in our book, Death by Umbrella! The 100 Weirdest Horror Movie Weapons. This entry was posted in Horror and tagged 70s movies, Supernatural by Really Awful Movies. Bookmark the permalink.